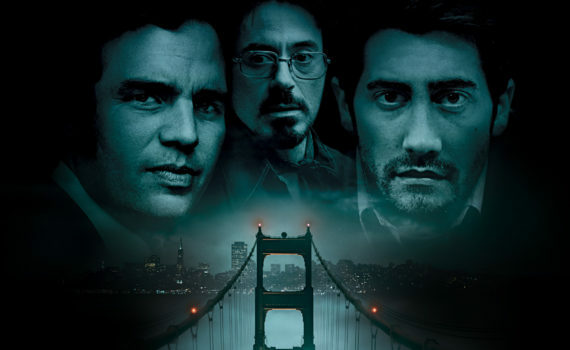 Starring: Jake Gyllenhaal, Mark Ruffalo, Robert Downey Jr.
How’s this for a filmography; Alien 3, Se7en, The Game, Fight Club, Panic Room, Zodiac, Benjamin Button, Social Network, The Girl with the Dragon Tattoo, Gone Girl. Holy smokes, that’s quite a list, and Fincher is just getting started; he’s only 55. He’s a powerful director, someone with the raw, unique vision to get noticed but then the intelligence to stay relevant. He’s great at adapting novels to film, or at choosing the right screenplays that do that for him, but either way it works, and he’s made a career out of it. For this movie, the author of the true life source material is also the main character of the story, so someone smart had to step in to pull off so much reality, and Fincher was definitely the man for the job. San Francisco, 1969. A killer strikes in the night, murdering a young couple, calling the police to say that he’d done it. The killer names himself Zodiac, and begins a spree that will span years and will take a dozen lives. He corresponds with the SF Chronicle, baiting the public into solving the case, something of which he is sure the police are not capable. And he has a point, the Zodiac murders go unsolved for years, with detectives scratching their heads as to how to get their guy. Robert Graysmith & Paul Avery, who work at the Chronicle, get far too involved, obsessing over the Zodiac until their own lives and careers are destroyed. Inspector David Toschi is just as zealous, but none of his men, nor anyone in California, can crack the case. Over the years, Zodiac turns into something of a myth, a legend that will never be fully understood, and a monster who may never be caught. Fincher does a job perhaps only he can do, taking an unsolved mystery that spans years and somehow making it interesting. Really, if you take the bare bones of this story, it’s very boring, and without giving it all away (although you can read all about it on Wikipedia), it doesn’t have a satisfactory ending. The fact that this film is well thought of is pretty incredible, and shows Fincher’s talent. He molds the story into something fascinating and quick, managing to stretch that over the span of years in real time and over two hours in movie time. Credit his cast for working some magic too; Gyllenhaal as the wide-eyed do-gooder, Ruffalo as the frank cop, Downey Jr. as the vivacious reporter. They do a phenomenal job in this film, and the rest of the cast is sprinkled with familiar faces as well: Anthony Edwards, Brian Cox, John Carroll Lynch, Chloe Sevigny, Elias Koteas, Dermot Mulroney, Donal Logue, Philip Baker Hall, Adam Goldberg. Zodiac isn’t a spectacular or entertaining feature, it’s a well-made docu-drama that finds a surprisingly large audience, a movie that works because those who made it are just that good.